This technical note will provide step-by-step instructions of how to handle partially privileged emails that you wish to code inconsistently for Privilege or Work-Product purposes. As documents are reviewed and tagged it is possible for members of an email family to be inconsistently tagged for 'Responsiveness' or 'Privilege'. This is usually not desired and usually the producing party wishes that if all members be consistently tagged. Our system was purposely designed to code documents consistently, to make sure that when an email body or attachment is coded Privileged or Work-Product, then the entire family is consistently coded. For example, if you tag an email as 'Responsive' and some of its attachments 'Privileged', the production validation feature will detect coding inconsistencies, and also give you the option to expand the entire email family to either just 'Responsive' or 'Privilege'. However, in the next paragraphs we explain two ways to manually separate the attachments from emails for privilege or work-product purposes. Lexbe eDiscovery Platform does not allow this to be overridden, as it would potentially dangerous to allow inadvertent production of privileged information. Most of our users do not want a system for production that could easily allow production of privileged information. As always, the document review and production should be handled by attorneys and experienced staff working on the case to ensure that the desired outcome was achieved prior to release to opposition. You can either redact only the privilege portion of the document or re-upload to Lexbe eDiscovery Platform the normalized PDF version of the email family separately. 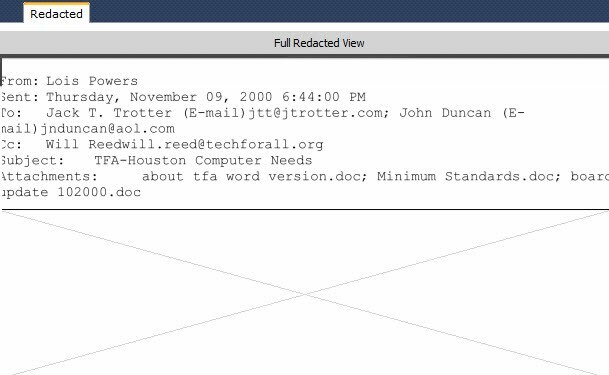 1-From the Browse or Search pages, open the document you wish to redact in the Document Viewer. 2-Once the file is opened from the Document Viewer, go the Doc Tab>Redaction and then click on the 'Open Redaction Editor' hyperlink. 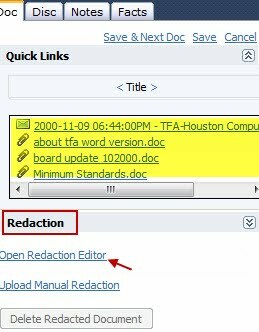 3-From the 'Redaction Editor' Page, select the area to redact with your mouse. It should draw a gray box around your selection and automatically open the 'Edit Redaction' Box. 4-In the Redaction Text, enter your custom message that can be saved, deleted or even canceled. 5-Once the text or graphic has been covered, you can click on the 'Save Redaction' button and the area selected will display how the redacted version of the file will look like (see example below). 6-Code the document as 'Responsive' if it is to be produced. Please also note that only the redacted versions of documents will be included into Lexbe eDiscovery Platform Productions under the ''PDF', 'TIFF' and 'TEXT' sub-folders, and our system also automatically withholds from the production the underacted version of the documents from the 'ORIGINALS' sub-folder. NOTE. In Lexbe eDiscovery Platform, the redaction displays a white overlay check-box that you can optionally edit with the 'Redaction Text' feature (e.g. 'Confidential'), so that your reason for redaction will show on the redacted text. This does not happen automatically and your custom tag information will not automatically print on the redacted text. Lexbe eDiscovery Platform automatically links the Email bodies and attachments of MSG emails processing in the system. Our system does not allow for inconsistent coding, as described above, to protect the consistency of responsiveness and privilege coding. If you do wish to inconsistently code emails and attachments as privileged, and do not wish to redact as described in Option 1, you can alternatively break the association of email bodies and attachments by downloading and then re-uploading the email and attachments in question. This will usually be more work than redacting and is a manual process. 1-From the Browse or Search pages, select the entire email body and attachments that you wish to inconsistently code, and then download the PDF versions of each to your local computer. You can also download PDFs from the document viewer>PDF tab. 4-Mark the body and attachments as needed for responsiveness and privilege. These can be inconsistently coded. 5-Remove the 'Responsive' and 'Privilege' tags from the original emails as they are being handled with the PDF versions uploaded and downloaded. Please also remove the original emails remove from the production. 6-We recommend doing these one at a time to keep emails and attachments consistent. We also offer eDiscovery Consulting and Technical Services (billable hourly) if engaged to support your efforts to review complex documents by helping you to separate email families and executing specific requests for document identification. Please contact your sales representative or our Support Center if needed.